What are Gemstone Dragons? They're just like your regular 'ol dragons, but instead of earning Dragoncash, they earn you GEMS! At level 1+, they give you 2 gems in 1 month. At level 4+, they give you 3 gems in 1 month. At level 7+, they give you 4 gems in 1 month. Finally, at level 10, they give you 1 gem per week! "Should you be lucky enough to breed an emerald dragon, you may notice they're imbued with a special magic from the Shimmering Isles. Small but powerful, the emerald dragon magically generates Gems... making it, and other gemstone dragons, the most sought after dragons in all the land. Emerald dragons originate from the crystal forests hidden within the Sedna Mountains. Because they're imbued with a special magic from the Shimmering Isles, these dragons can NOT breed with other dragons." 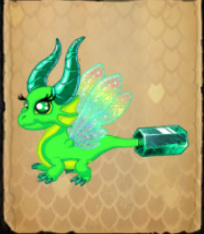 The Emerald Dragon was the very first Gemstone Dragon to be released in mid-May 2012. The dragon's breeding combination was Crystal x Lichen, or Lichen x Crystal. "Pearl dragons are known for being some of the most playful and friendly dragons in all the land. If you ever see them in the wild, the chances are high that they will be racing other gemstone dragons near the sea surrounding the Shimmering Isles. This year the pearl dragon was able to beat the alexandrite dragon and our wizards cast an amazing spell to allow you to breed them. You may also notice that these exceptionally rare dragons are imbued with a special magic that prevents them from breeding with other dragons." 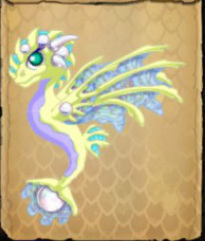 Pearl Dragons were the 2nd Gemstone Dragons to ever be released on June 1, 2012. The combination was soon confirmed to be Snow x Seaweed, or Seaweed x Snow. "The ruby dragon was discovered deep in the Mogok Caves by an old wizard who simply went by the name Mohs. He quickly learned the error of reaching for rubies when they are attached to the tail of a dragon. 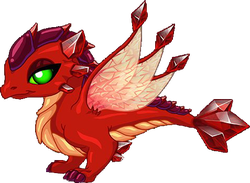 Ruby dragons, like all gemstone dragons, cannot breed." The Ruby Dragon was released on July 1st, 2012. The pairing to breed one is Chrome x Scorch or Scorch x Chrome.